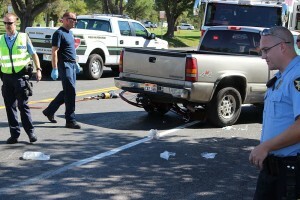 ST. GEORGE — A cyclist riding the wrong way at a corner in St. George Friday morning was struck by a pickup truck, run over by the truck and then trapped beneath it. Just before 11 a.m. police, fire and ambulance were dispatched to the corner of 600 East and 100 South in St. George, across from the city cemetery. 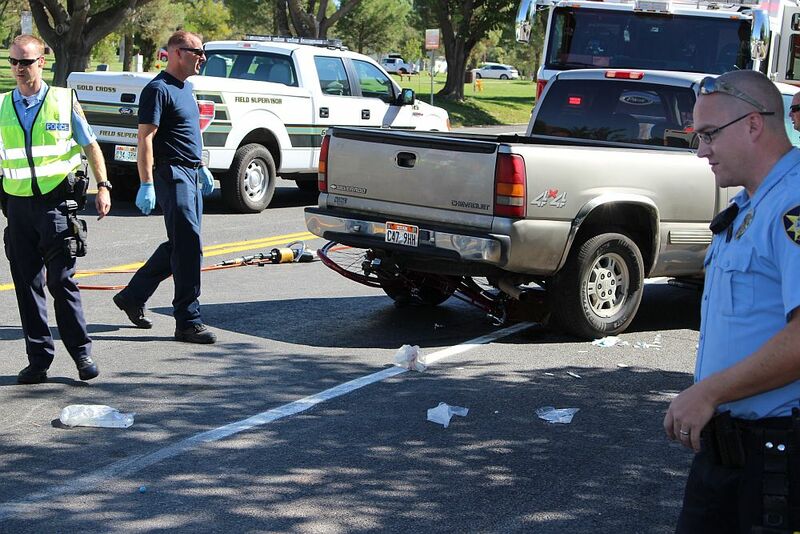 Upon arrival, responders found an 18-year-old St. George woman trapped on her bicycle underneath a pickup truck. “The pickup was traveling north on 600 East,” St. George Police Officer Tyrell Bangerter said. The pickup driver stopped at 100 South, Bangerter said, where witnesses said the cyclist was traveling toward him riding against traffic. The bicyclist was trapped under the truck. The cyclist’s injuries were “non-life-threatening, but definitely serious,” Triplett said. The cyclist was immobilized at the scene by Gold Cross Ambulance paramedics and then taken to Dixie Regional Medical Center in St. George. Citations are pending further review by officers, Bangerter said. Units from the St. George Police and St. George Fire Department and Gold Cross Ambulance responded to the incident. Hah! I see what you did there. Since I like to be accurate, I looked it up. My dictionary says “Infer: to guess; speculate; surmise and to hint; imply and suggest.” Thanks, always interested in a grammar lesson. I hope the truck wasn’t damaged.. the bicycle rider is completely at fault.!!! How do you know that you are in St. George, UT? When you read a redneck comment like this one. How many teeth do you have? I only ride my bike on sidewalks, two times I had some one leave their lane and it has always been cell phone related. These people that ride their bikes with traffic in this city are asking for a short life span. I do not care if I get ticketed by cops and will gladly pay the fine. As a cyclist I can say that StG roads are really quite safe as long as the cyclist is obeying the law and pay attention. Choosing the right roads is also important. The thing that’s most dangerous is anyone under 40 with a cell phone. I’m talking about you soccer mom in your SUV. I agree. Folks who think these drivers are the worst have either forgotten or have never been around other cities. As on a motorcycle, ride as if you are not expecting drivers to see you and you will be safer.